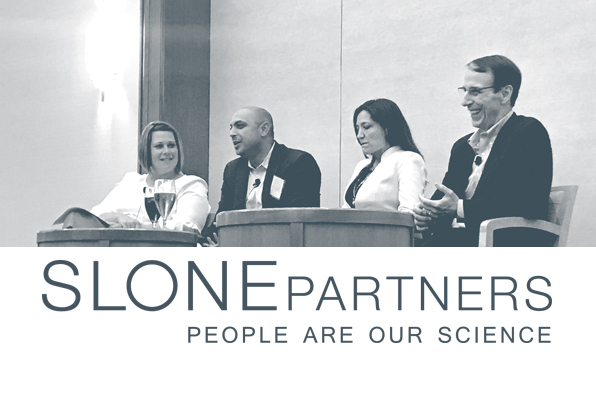 BOSTON, JUNE 2018 – Slone Partners, North America’s leading executive search firm for life sciences and diagnostics companies, organized a dynamic panel discussion – Insights: Culture As A Cornerstone – examining the ways, means, and importance of activating board members and senior executives to build thriving cultural environments. As part of its ongoing series of dynamic live programming the Company produces on a quarterly basis in healthcare epicenter markets such as Boston, San Diego and San Francisco, the 90-minute discussion was attended by nearly one hundred esteemed healthcare-industry executives. The evening, held at Seaport World Trade Center & Hotel, was hosted by Slone Partners CEO Leslie Loveless, President Tara Kochis-Stach, and Founder Adam Slone. The panel participants – Moderator Sarah Larson, Partner & Chief Human Resource Officer at Third Rock Ventures; Russell Campanello, Executive VP Human Resources & Corporate Communications at iRobot; Sanjiv Patel, Chief Executive Officer at Relay Therapeutics; and Coco Brown, Chief Executive Officer at Athena Alliance – lent a wealth of executive expertise and deep context as to the complexities of both establishing and fostering thriving corporate cultures. And discussed the paramount importance of activating boards of directors, boards of advisors, and senior executives to participate in attracting and retaining human capital that are vital to business growth and employee happiness. Our moderator and panelists come from the worlds of venture capital, portfolio management, human resources, communications, the C-suite and those who establish boards of directors and advisors. Here is their advice. Culture is what a company thinks, how it behaves, what values it holds, what it believes or believes in, and the common mindset that binds and connects its people. The strongest cultures are almost religious, transcending mere missions, getting into distinguishing attributes that create senses of belonging, and connecting people regardless of hierarchy. Ideally, everyone owns it, and everyone lives it. Culture starts in the boardroom and in the C-suite. Company cultures can deliberately change quickly or evolve over time by senior leadership who thoughtfully alter approaches in what they do and how they do it. Create environments where people love coming to work through thoughtful and strategic decisions. Do companies have to be transparent about cultural shift? Smaller, nimble organizations tend to be more so. Every single person makes a difference. Advice: Create an archetype of talent and passion, show resilience and perseverance as culture permeates downward. In times of low unemployment where small pools of top talent have abundant choices, culture becomes more vitally important to employees. The best candidates are curious about culture, wanting to understand it more, understanding the importance of a symmetrical fit to their beliefs, approaches and personalities. Employers who recruit to values and mindsets help to spread workplace behaviors that promote worker satisfaction and happiness. Advice: Be careful about over-recruiting to culture and becoming narrow in thinking. This can result in a “sameness” throughout the organization that inhibits the creativity that invites the best ideas and strategies. Culture is ultimately the responsibility of the board. Companies that recruit board members who bring positive change, and not just expertise, ultimately have stronger cultures. Board members must also honestly ask themselves “Is this a culture I want to associate with?”, and the absence of board candidates asking culture questions and caring about the answers is a red flag. Advice: Boards should not only have culture committees, but have a CHRO on the board who understands people. Diversity is important because it supports creativity and innovation; however, women and minorities don’t want to be recruited merely because they’re women and minorities. New perspectives are born from diversity of ethnicities, ages, genders, nationalities, backgrounds – which tends to bring the best out of everyone. It helps people to work better together and understand more about each other. Advice: If management doesn’t care about diversity, it’s a red flag, because homogeny doesn’t breed culture excellence. Talent branding brings realness and humanity to organizations that easily says “who we are” to the world, to clients, and to marketplaces through honesty, storytelling and embracing both strengths and imperfections. Individual people, pervasive culture, values and behaviors help attract candidates as salaries and titles are commoditized between competing organizations. Instead, spotlight talent through company websites, social media and encouraging realness between employees and outside contacts, allowing people to shine. Advice: Utilizing talent branding techniques both internally and externally can both build and reinforce culture while also attracting and retaining top talent. New company cultures can be driven by a single founder through personality, understanding that utilizing personality can actually create something the company can leverage as an ongoing foundation. Vulnerability isn’t necessarily a downside as it helps to build trust. Advice: Put in the effort, be intentional, and establish early what the 3-5 things are that drive how “we” work – it will attract others with shared values.